Sagadahoc County, southwestern Maine, U.S. 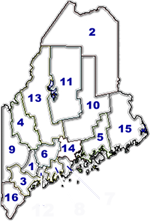 It has the smallest land area of any county in the state, consisting of a coastal region bounded to the southwest by the Androscoggin and New Meadows rivers, to the south by the Atlantic Ocean, to the southeast by the Back River and Sheepscot Bay, and to the northeast by the Kennebec River. Merrymeeting Bay is at the confluence of six rivers, notably the Androscoggin and Kennebec. White pine is the dominant species of tree in the county. Recreational areas include Reid and Popham Beach state parks. Sagadahoc county was created in 1854; its name was derived from an Abnaki Indian word meaning "river mouth." The county seat is Bath, a city known for shipbuilding since the mid-18th century. Popham Beach was the site of a temporary English settlement (1607), the starting point of Benedict Arnold's march to Quebec, Can. (1775), and Fort Popham (built 1861). The principal towns are Topsham, Richmond, and Woolwich. Shipbuilding remains the county's main source of income. Area 254 square miles (658 square km). Pop. (1990) 33,535; (1996 est.) 35,508.